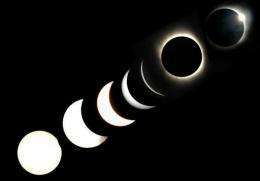 File photo shows the various stages of a total solar eclipse. An annular eclipse of the Sun, when a ring of everyday Sun remains around the Moon's silhouette, will sweep across the Australian outback and into the Pacific Ocean on the morning of May 10, local time. Though about 95% of the solar disk will be covered, the remaining 5% of Sun will be so bright that the darkening of the sky would hardly be noticeable except to those watching through specially filtered glasses. Unlike the case for the recent total eclipse, the special filters must be used throughout the entire event. Prof. Jay Pasachoff of Williams College in Massachusetts, USA, the Chair of the International Astronomical Union's Working Group on Eclipses, will be viewing his 56th solar eclipse. "Solar eclipses can be inspirational to students and others, so it is interesting to have everyone view the eclipse, but only safe methods of viewing should be used," he cautions. Pasachoff is traveling with Melissa Hulbert of Sydney Observatory and others to the vicinity of Tennant Creek for the event. The event there will occur for a few minutes shortly after 8 a.m. local time. The rest of Australia will see a partial solar eclipse. During the partial phases or annularity, the remaining solar disk is too bright to look at safely, unless you are looking through specially filtered glasses that knock out 99.999% of the sunlight. Accidental projection of a partly eclipsed Sun should be visible on pavement or building walls in what is known as pinhole projection, with the small hole usually formed from small spaces between the leaves of trees. Binoculars can be used safely only if they are used to project an image down on the ground or across on a wall, given the low angle of the Sun; it is hazardous to look at the Sun through binoculars unless they are properly filtered. The annular phase will start in extreme northwest Australia in the state of Western Australia, where some veteran eclipse chasers will try to see it at sunrise. The 300-km-wide path will include Tennant Creek, about 500 km north of Alice Springs in the Northern Territory. The path of annularity will leave the Australian continent well north of Cairns, where tens of thousands of people saw a total solar eclipse in November, and even north of Cooktown; Cliff Island and Flinders Group National Parks will be in the zone. Annularity will last about 3 minutes at Tennant Creek and about 4-1/2 minutes at the centerline, about 50 km north of Tennant Creek. The path of annularity will leave Queensland with about 4-3/4 minutes of annularity. While traversing the Pacific, the path of annularity will include the Hula peninsula of Papua New Guinea, where Pasachoff saw the 1984 total solar eclipse, and the northwestern Solomon Islands. The peak duration of the eclipse will be slightly east of the Tarawa (Kiribati) islands, with about 6 minutes of annularity. Weather permitting, everyone in Australia, except for the western third of Western Australia, would be able to see a partial eclipse. The Sun's diameter will be 36% covered in Melbourne at about 8:50 a.m. local time, 38% covered in Canberra, 39% covered in Sydney at about 8:55 a.m. local time, and 52% covered in Brisbane. Partial phases will also be visible in the southern Philippines, in eastern Indonesia, in Papua New Guinea, and in the northeastern part of New Zealand's south island and all of its north island, though with only 8% coverage in Auckland. Also within the zone of partial phases are the entire Hawaiian Islands, with 44% of the solar diameter covered in Honolulu at maximum. The northeastern limit of the partial eclipse occurs just off the western coast of Baja California. The next total eclipse of the Sun will cross mid-northern Africa on November 3.